9th November 2017, New Delhi: The GST council in its October meeting had accepted a series of inputs raised by businesses via the GST circle which included making GST returns filing quarterly and suspending the Reverse Charge Mechanism. As the GST council gets ready to meet in Guwahati this week, businesses have raised a series of issues. 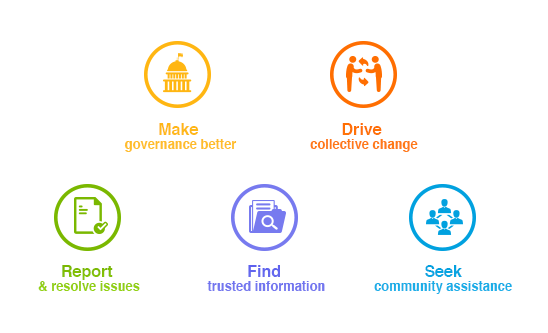 LocalCircles conducted a set of polls to ascertain these asks and received inputs from over 13,000 businesses. 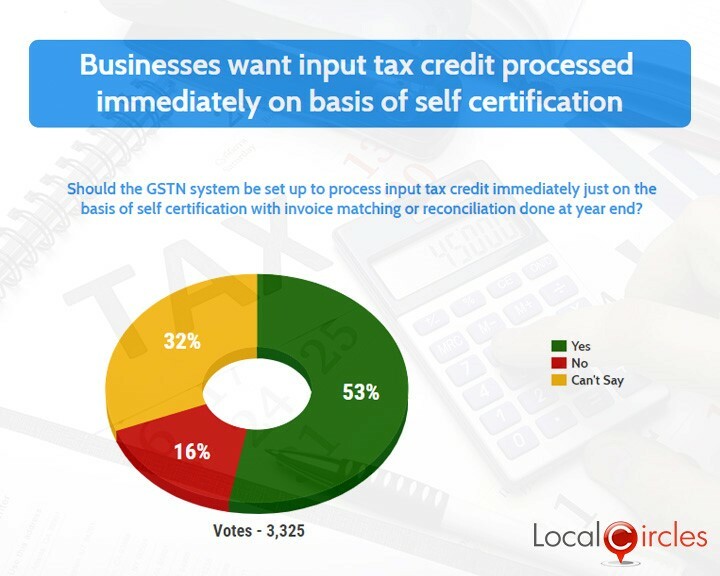 The first question asked if the GSTN system should be set up to process input tax credit immediately just on the basis of self-certification with invoice reconciling done at the end of the year. 53% respondents agreed with it while 16% did not agree with it. 32% were unsure about it. 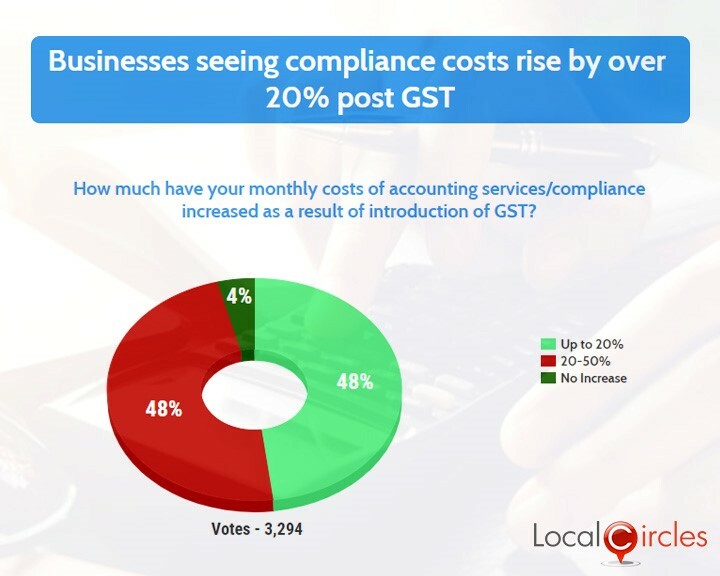 The results of the second poll showed that 48% businesses are seeing compliance costs rise by up to 20% post-GST and 48% say it has risen by 20-50%. Many taxpayers had earlier complained that filing GST returns needs dedicated resources, due to which their costs have gone up and their profits have decreased. The next question asked citizens what was the biggest difficulty being faced by them in filing GST returns. 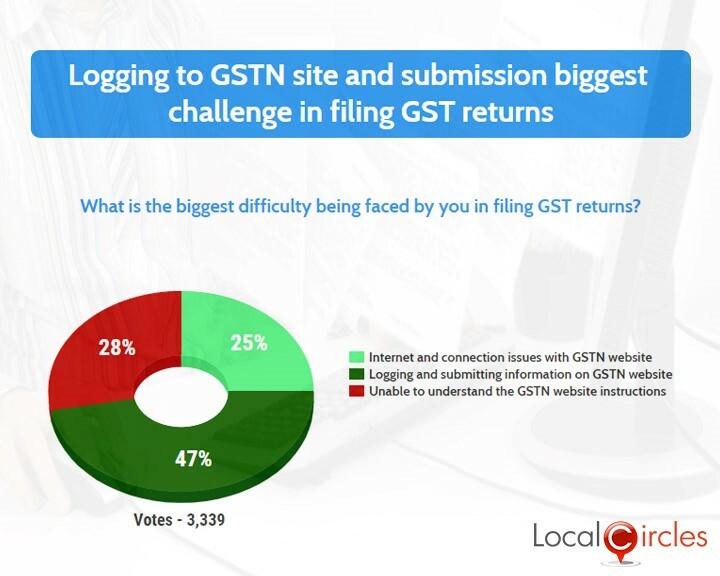 47% said logging and submitting information on GSTN website was the main issue while 25% said internet and connection issues with GSTN website bothered them the most. 28% said they were unable to understand the GSTN site information which was creating problems for them. 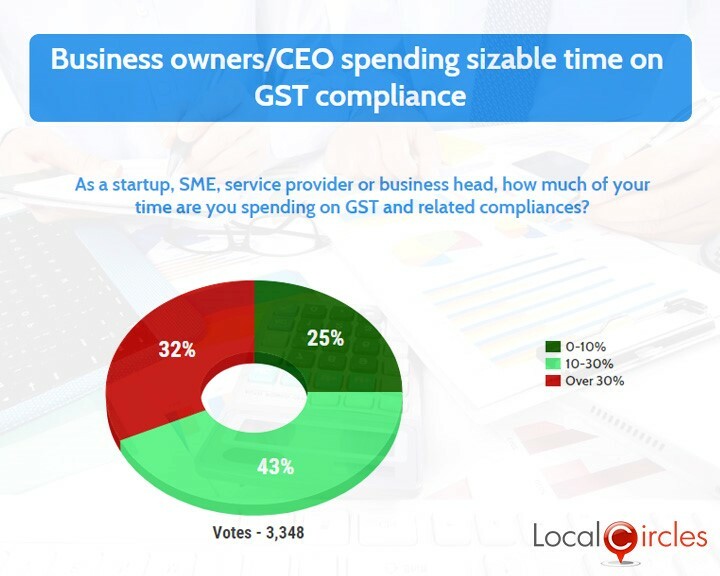 The last question asked startups, SMEs, service providers or business heads how much time they were spending on GST compliance. 25% said they were spending up to 10% of their time on GST compliance, 43% said they spend 10-30% of their time while 32% said they spend over 30% of their time on GST compliance. 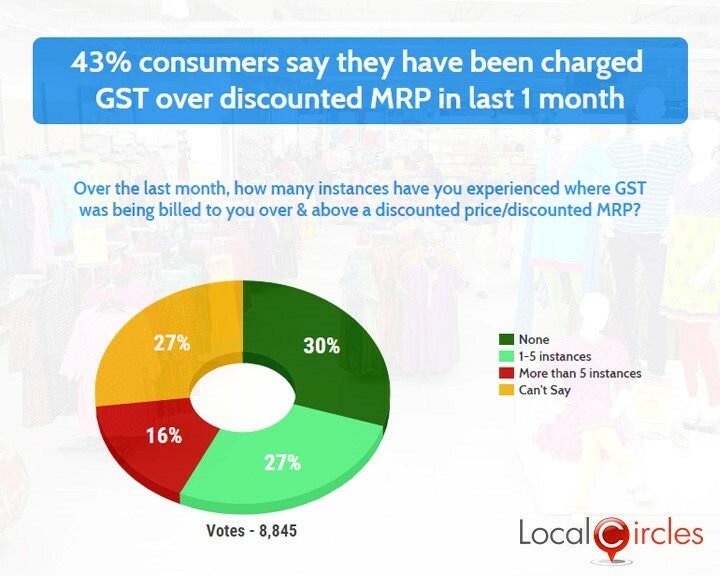 On the consumers front, 43% consumers said that they were still charged GST on discounted MRP in the last one month. 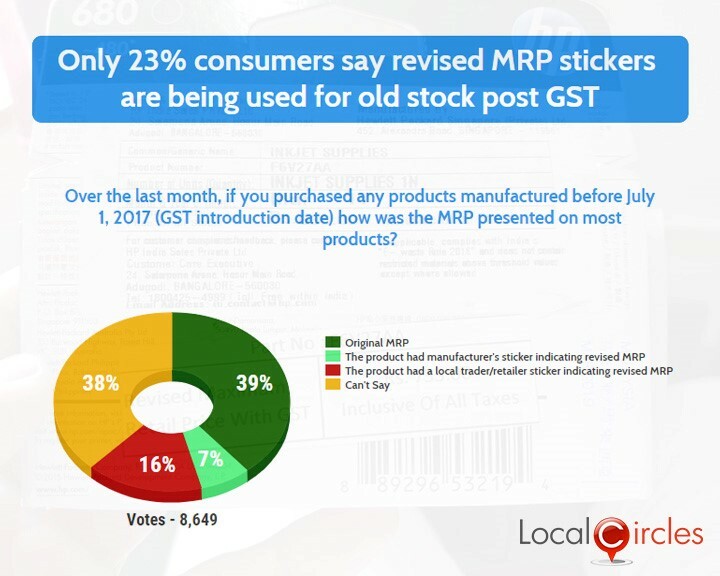 Only 23% said sellers are using revised stickers on old stock post GST and complying with the government notification. 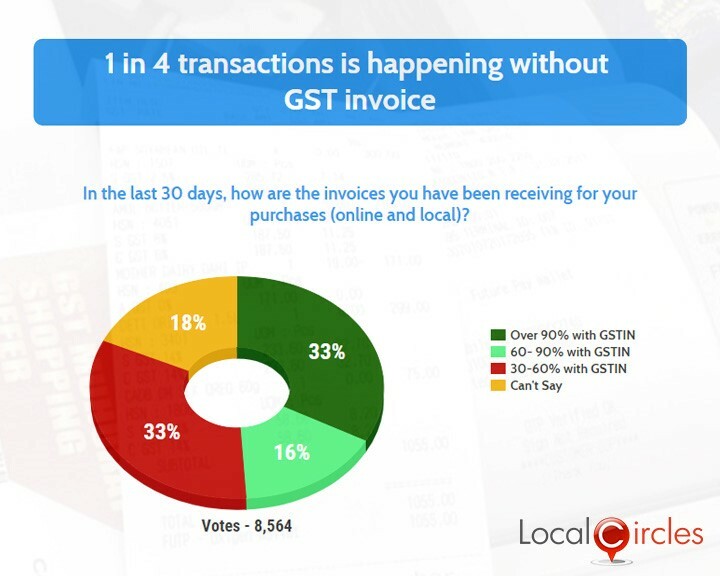 Per inputs from consumers, in 75% cases GST invoice in being given by the vendors while in 25% cases the transaction is taking place completely outside the GST system, i.e. in cash without any invoicing. Over 33,000 consumers responded to these polls.